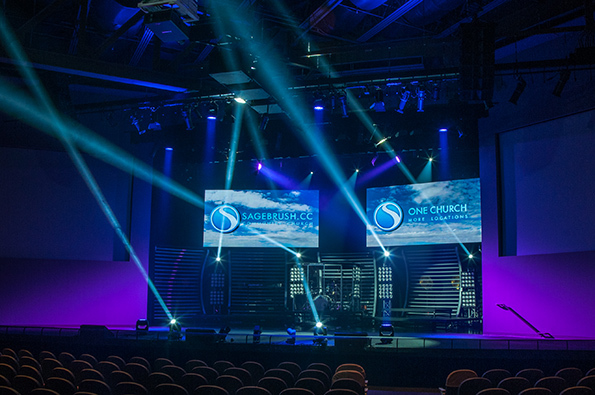 Sagebrush uses quite a lot of video in services and performances, so when the new phase was started, they took advantage of the timing to upgrade the system, including a state-of-the-art production control room, new projectors installed by Advanced Presentation Systems, and two 10’x5′ screens comprising 100 Elation Professional EPV762 LED 7.62mm pixel pitch video panels, 50 panels each side, as well as an Elation EPV Image VSC video processor. 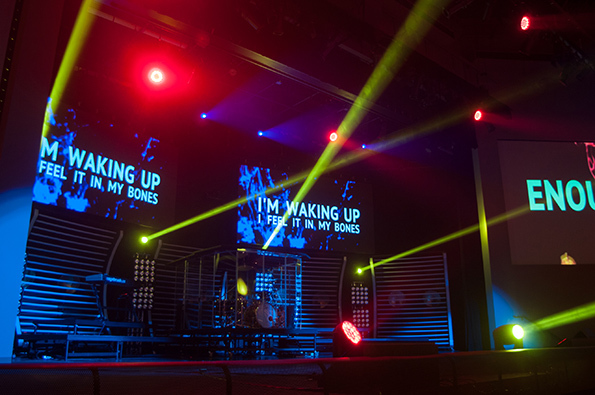 Two rear-projection screens and a front projection screen add layers of video to the stage. The positioning allows content to be viewed from a wide angle since the seating is shell style. Video of the services can be captured, edited, and rebroadcast at the mobile Sagebrush locations, and podcasts are posted online for download. “In the current configuration, [the panels] are hung in two sets of 50 panels that can merge as one to become as large as the entire width of the stage,” MacArthur says. “The viewing angle in the facility is extremely wide, and because of that, the 100 panels give us enough space coverage at the back of the band performance area to be adequately seen from all seats in the congregation.” Marc Campanozzi is the facility’s production director. 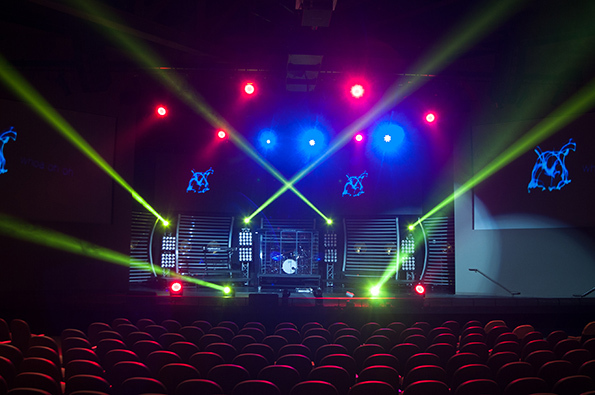 The lighting rig features predominantly Elation Professional fixtures—Platinum Spot 15R Pros, Platinum Spot 5R Pros, Platinum Beam 5Rs, Platinum Wash ZFX Pros, and TVL 3000 II warm white units—as well as Philips Strand SPX ellipsoidals, and Wybron Cygnus LED units, both RGB and white versions. An Elation EW-DMX-T wireless DMX transmitter and two receivers, as well as MDG Atmosphere 5000 hazers and TMB DMX-controlled fans, round out the system. Dimming is via a 196-channel Strand C21 system. The moving lights are mounted in the FOH catwalks, on upstage and downstage pipe-grids, as well as onstage and on multiple ground-supported towers and props. 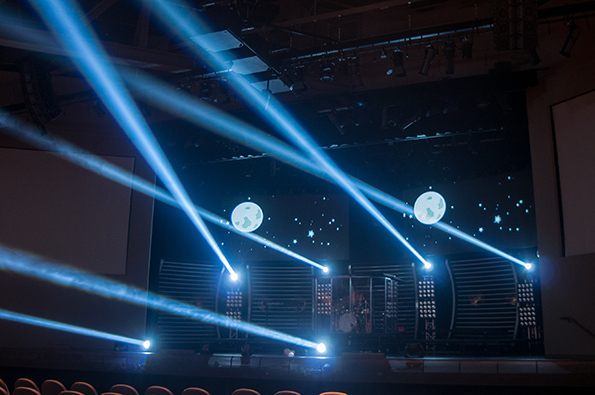 “We use 13 universes of Philips Strand ShowNet to convert to DMX,” says Almanza. “It has nodes, and because it’s a networked system, it’s all based on IP addresses, so I can take one of those nodes, put in anywhere I want, and plug into it, and now I have DMX access, a universe, wherever I need it. 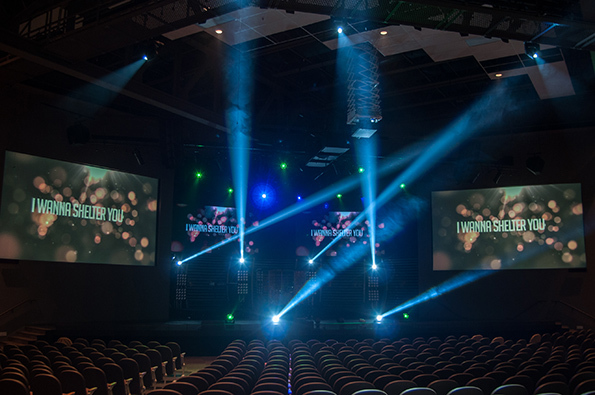 It’s a very flexible system and works really nicely.” The Platinum ZFX LED fixtures’ built-in wireless DMX transmitters and receivers are used for ground-supported lighting, while the TVL 3000s work as footlights for the pastor for services and video capture. A Philips Strand VisionNet system manages the architectural lighting in the venue.